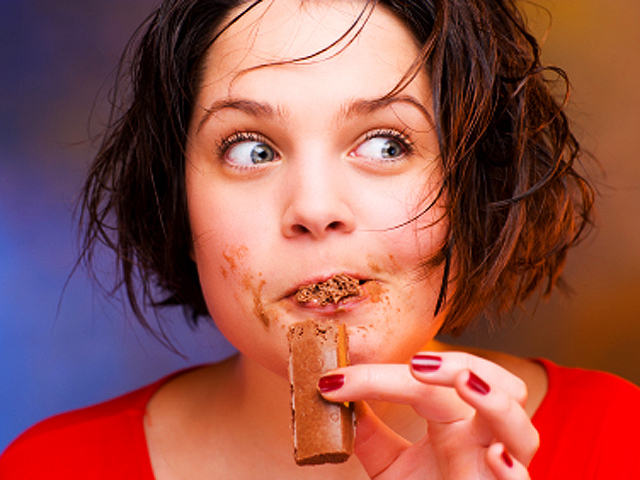 Chocolate curbs stroke in women, study suggests: What about men? (CBS) Chocolate seems to be good for the cardiovascular system - no secret there. Studies have tied the sweet stuff to lower blood pressure, healthier blood vessels, and reduced risk of blood clots. And now Swedish researchers have linked chocolate to a reduced risk for stroke. For the 10-year observational study, scientists at the Karolinska Institute used questionnaires to compare chocolate consumption and stroke risk in more than 33,000 women between the ages of 49 and 83. The scientists found that the women who ate the most chocolate - 66.5 grams a week, or about 2.4 ounces - were 20 percent less likely to have a stroke than the women who never or seldom ate chocolate. The study was published in the October 2011 issue of the Journal of the American College of Cardiology. The study doesn't actually prove that it was the chocolate that reduced the stroke risk. But "we controlled for other known risk factors for stroke and the results persisted," study author Dr. Susanna C. Larsson, of the Institute's Institute of Environmental Medicine, told CBS News in an email, adding that "The results should apply to men as well." But before you unleash your inner chocoholic, be aware that not all forms of chocolate are thought to be beneficial. Dr. Larsson and other experts say dark chocolate is best because it contains more of the antioxidant-rich cocoa and less sugar and fewer calories than milk chocolate. No matter what, experts say it's important to keep the findings in perspective. As Dr. Nieca Goldberg, a cardiologist at New York University Langone Medical Center told HealthDay, "These findings don't mean that people need to exchange chocolate for broccoli in their diet." The Cleveland Clinic has more on the effects of chocolate on cardiovascular heatlh.